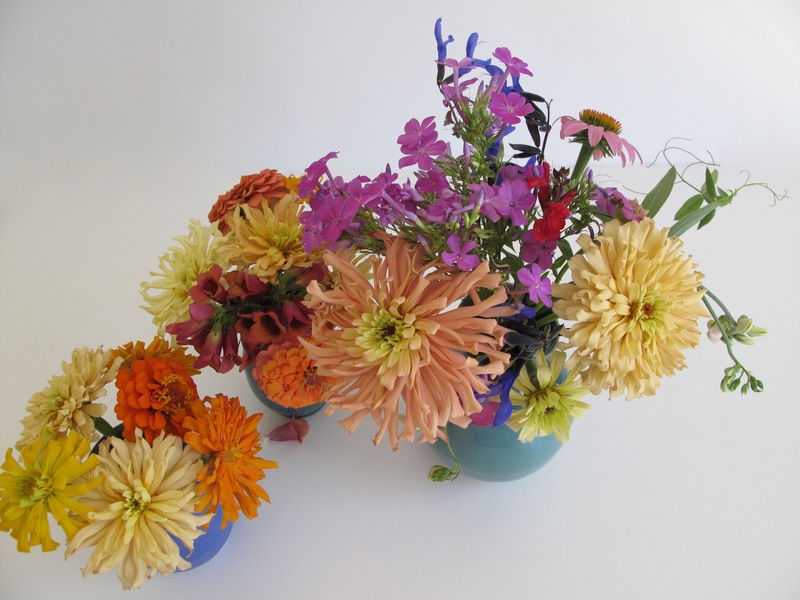 Back from an energizing, restorative week at the beach I am catching up on blogs, comments, laundry and such, and scampering to join Cathy’s In A Vase On Monday with a few flowers from my late summer garden. For sharing today there are mostly zinnias with a tasting of other flowers speckled throughout. Digitalis Foxlight ‘Ruby Glow’ was the starting point for one small vase, accented with zinnias in cream, apricot, yellow and orange. There is also one little marigold, the first to open from seeds planted at the same time as the zinnias. 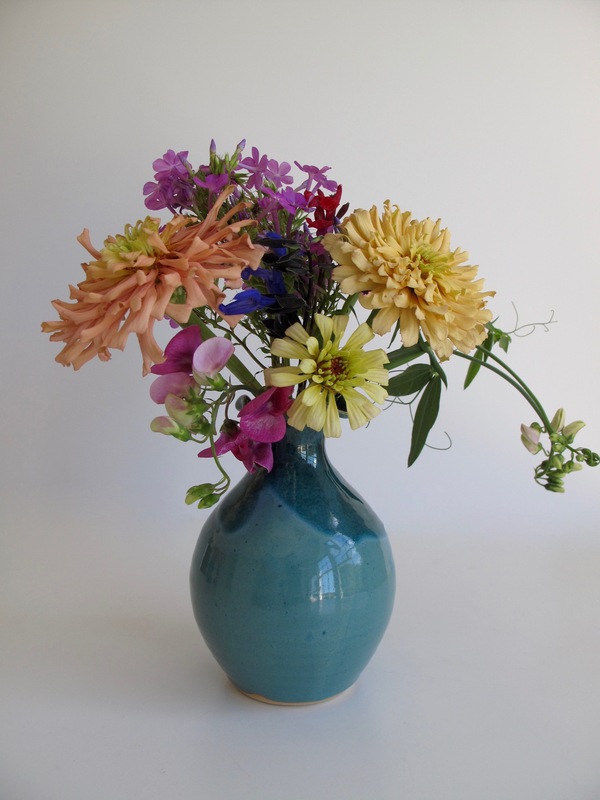 There were enough blooms to fill a second small companion vase in similar colors. A larger turquoise vase holds the remnants of my quick garden foraging: two intensely hued salvias, S. guaranitica ‘Black and Blue’ and S. greggii ‘Furman’s Red’; several sprigs of Phlox paniculata, possibly ‘Robert Poore’; a springy stem of passed-along everlasting sweet pea; and three more zinnias. The peach colored cactus zinnia has captured my heart. Thanks to Cathy for hosting this weekly chance to express our flower arranging passion. Visit her at Rambling In The Garden to discover what she and others are placing In A Vase On Monday. This entry was posted in garden and tagged cactus zinnia, Digitalis Foxlight 'Ruby Glow' (Ruby Glow Foxglove), flower arranging, flower design, in a vase on monday, nature photography, zinnia on August 22, 2016 by pbmgarden. Lovely! never thought I would see Foxgloves and Phlox paniculata at the same time in a vase from the Southeast. Inspired by yours I bought Cactus Zinnia seeds to try this winter. Thank you! I’ve been so delighted with that foxglove this year. It’s unusual for either foxglove or phlox to be blooming in my garden at this point in the summer. 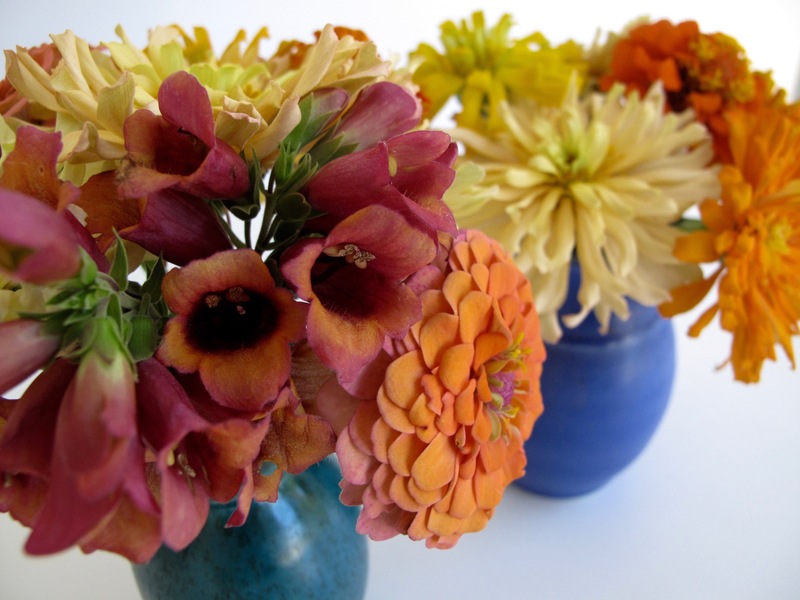 Oh, I do hope you’ll enjoy the cactus zinnias and will look forward to seeing them in your vases. I did a double take when I saw what was in your vase! Cactus Zinnias will be an interesting experiment, it is weird what will and will not grow here. They came out with a summer Dianthus for South Florida this year, decided to wait to try that. Oh, I do like the color combinations. Those Zinnias are scrumptious! Thanks Beth. Some years all my zinnias turn out mostly pink. I like this year’s crop and will try to save seeds. I adore those ruffled cactus-type zinnias. Note to self: plant those from seed next year! Kris, please remind me next year to plant the cactus zinnias again too! Those are really special zinnias! Thanks Cindy. Glad I tired different kinds this summer. Those cactus flower Zinnias are gorgeous. Reminds me of the Dahlia I’m growing but so much easier and a better size. Had not seen a Zinnia that I liked this much in the past. Hi Linda, I agree growing zinnias is easy that growing dahlias. My dahlias are not very productive. Glad to hear it Judy. Hope your zinnias are still smiling on you as well. The cactus Zinnia looks almost like a Dahlia. 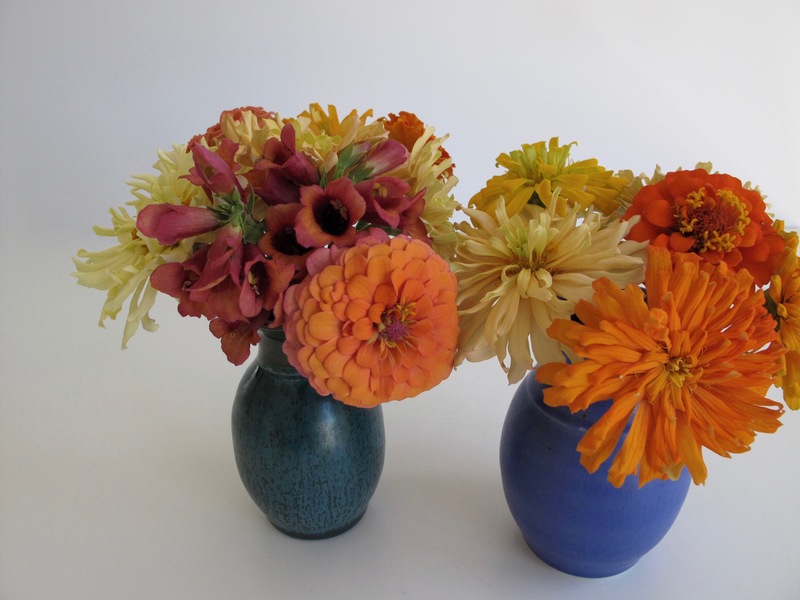 The sherbet-like colors are a cool treat in their zingy blue vases. 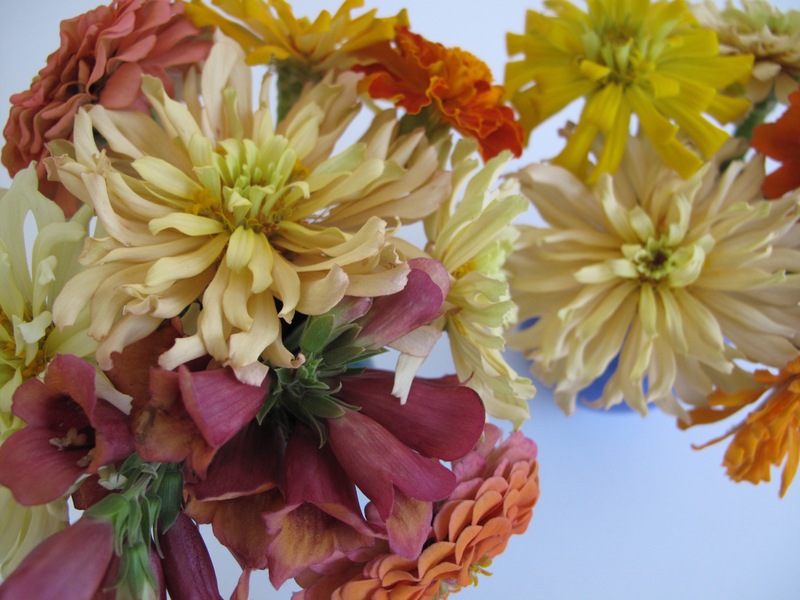 Ricki, the cactus zinnia has become my favorite this summer and more dependable than dahlias. These arrangements are so beautiful! 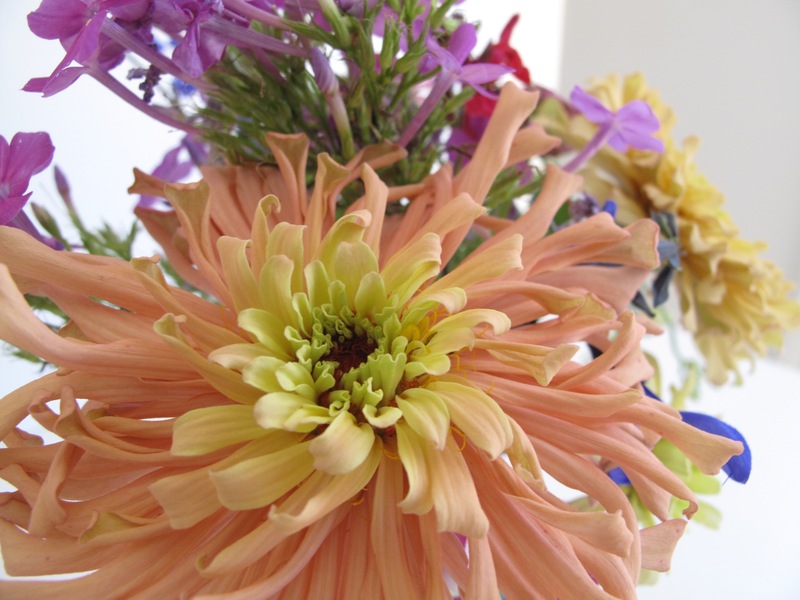 Like you, I’m in love with the peachy cactus zinnia – it’s marvelous. Thanks. We hadn’t taken a whole week for many years either and it was restorative. I love the pastel colors of the zinnias and the foxglove is so unusual. Thanks. That foxglove has been a surprise wonder this summer. Usually they die on me rather quickly. Love those zinnias Susie. I have some similar ones only just getting started as I planted them late. Thanks Cathy. Most everything else is scraggly now in my garden but the zinnias are fresh popsicles of color.